It’s remarkable how many policies and principles in Bowen Island’s Official Community Plan (OCP) anticipate the proposal we are making for Seymour Landing. The following table provides a brief summary of OCP policies that manage growth on the island. The table includes a brief description of policies and potential opportunities for their application at Seymour Landing at Cowan Point. 332 Non-consumptive marine recreation activities, such as sea kayaking and sightseeing, are encouraged. All envisioned recreational activities are non-consumptive, and are in tune with the lifestyles fostered and expected from residents and visitors alike. Sea kayaking, hiking, walking, golfing, bird watching and cycling are but a few activities that promote community interaction and good health. 352 The Municipality encourages the creation of small-scale Greenways such as natural microhabitats, community outdoor gathering spaces, as well as pedestrian, equestrian, and biking trails. Neighbourhood Greenways will also be encouraged to incorporate green infrastructure features such as natural storm water management, wildlife habitats, and environmentally friendly landscaping elements. An extensive system of greenways and trails has been developed throughout the Cowan Point development, including Seymour Landing; however, it lacks users and taxpayers to help offset the significant maintenance expenses associated with such community infrastructure. New trail links to adjacent waterfront sections will provide valuable access to previously inaccessible areas, and will link the enlarged waterfront park at Seymour Bay with the waterfront sections to the northeast. 356 Within the Belterra Lands and the Seymour Bay area of the Cowan Point Comprehensive Development Area, consideration may be given to townhouse, multi-unit housing, including affordable housing, which meets the needs of island residents. Current zoning permits attached and detached dwelling units. Zone regulation refinements could be made that would stimulate the provision of smaller unit sizes, townhouses and multi-unit housing options. - Housing that is compact, accessible and meets the Green Building Standards set out by the Municipality. This policy forms part of our application rationale and, as in the past, we will use the green building standards as valuable guidelines. A mixture of smaller dwelling units within walking distance of services and amenities is a desirable planning objective. - Encourage the design of communal spaces (e.g., porches, shared gardens, common rooms) into affordable and special needs housing. Similar to the opportunities associated with policy 358. Seymour Landing has existing infrastructure that is well suited to support many of these uses. 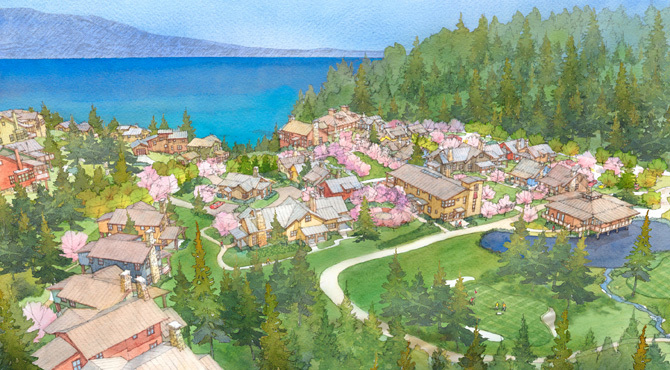 In the short- to medium-term, the Independent/Supportive Living envisioned at Seymour Landing will lead to a wider vision of Bowen Island being an ideal place for ‘supportive living’ or ‘multi-level care’ communities. 419 Tourist commercial facilities are supported that enhance visitors’ enjoyment of the island’s natural amenities, without detracting from those amenities. Facilities that are designed to be primarily destination attractions are not supported. The envisioned development at Seymour Landing, including a retreat, an Inn/Resort with associated Commercial Guest Accommodation, and the passenger ferry service, is intended to complement and enhance tourist commercial facilities throughout the island. The OCP contains General Land Use Management Principles in Section 3.3.1. Principle 1 provides that new development should primarily take place within, or adjacent to areas of existing development activity. Amendments to Areas A, B, and C of the CD 6-2 Zone will facilitate the viability of a mixed-use community hub at Seymour Landing, anchored by a new small passenger ferry dock. The proposed residential areas are concentrated near and will be integrated with plans for the mixed-use node and community amenities. Most of the infrastructure needed to serve the proposal in this application — be it roads, water lines, sewer lines, hydro service, stormwater systems, or trails — is already in place or close to existing property lines. In the recent past, major investments have been made to build an extensive road network, to build a large water treatment plant, to construct a major concrete dam to increase the water storage capacity of Josephine Lake, and to build a sewage treatment plant and an ocean outfall, all connected by an extensive network of water lines, pressure reducing valves, sewer lines, pump stations, hydro lines (including 3-phase service), etc. The current capacity to serve exceeds the existing and future demands based on current zoning. The applicant will provide all required expert and consultant reports (at no cost to the Municipality) to confirm the capacity to serve the proposed developments. Apart from the fact that most of the needed infrastructure is already in place, equally important is the need for costs of ongoing operation and eventual replacement of infrastructure to be shared by the largest number of users acceptable. Not to follow that principle will lead to the waste of precious resources and capital, and will burden a small number of users with high costs because of the inefficient use of existing infrastructure. Principle 2 states that adjustments to the location, size and density of existing lots is encouraged, as a way to shift towards a more sustainable settlement pattern. The site planning concept for Areas A, B, and C support this principle. It envisages providing efficient access to the new small passenger ferry dock, bringing intensity of residential use within walking distance of the community node at the passenger ferry dock, and maximizing use of the sunny portions of the site for pedestrian and people-oriented uses.